One of the most common methods for manufacturing elbows is using hot mandrel bending from straight steel pipes. After heating the steel pipe at a elevated temperature, the pipe is pushed, expanded, bended by the inner tools of mandrel step by step. 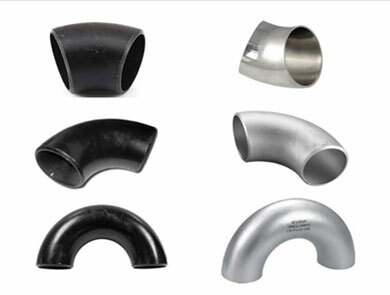 Applying hot mandrel bending can manufacture a wide size range seamless elbow. The characteristics of mandrel bending are strongely depend on the intergrated shape and dimensions of the mandrel. The using advantages of hot bending elbows include smaller thickness deviation and stronger bending radius than other bending methond type. Meanwhile, using bending instead of prefabricated bends substantially reduces the number of welds needed. This reduces the amount of work required and increases the quality and usability of pipes. However, cold bending is the process to bent the straight steel pipe at normal temperatures in a bending machine. 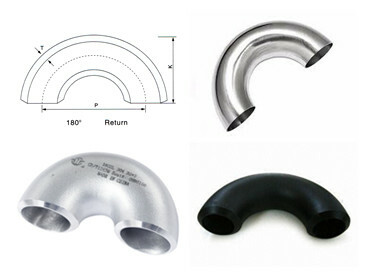 Cold bending is suitable for pipes with an outer diameter of 17.0 to 219.1 mm, and wall thickness 2.0 to 28.0 mm. The recommended bending radius is 2.5 x Do. Normally at a bending radius of 40D. By using cold bending, we can get small radius elbows, but we need to pack the internals with sand to prevent wrinkling. Cold bending is a quick and inexpensive bending method. It is a competitive option for making pipelines and machine parts. Welded elbows are made from the steel plates, so it is not seamless steel elbows. Use a mould and press the steel plate to the shape of the elbow, then weld the seam to be a finish steel elbow. It is the old production method of the elbows. Recent years the small sizes elbows are almost manufactured from the steel pipes now. 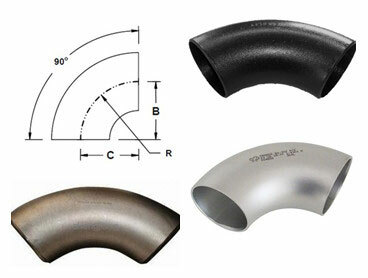 For the big size elbows, for example, it is very difficult to produce elbows over 36'' OD from the steel pipes . So it is commonly made from the steel plates, pressing the plate to the shape of half elbow, and welding the two halves together. Since the elbows are welded in its body , the inspection of the welding joint is necessary . Commonly we use the X-Ray inspection as the NDT. Elbow is a pipe fitting which used as a connection point between two pipes which can change the direction to any angle as per requirement. An elbow angle can be defined as the angle by which the flow direction deviates from its original flowing direction.Even though an elbow angle can be anything greater than 0 but less or equal to 90° but still a change in direction greater than 90° at a single point is not desirable. Normally, a 45° and a 90° elbow combinedly used while making piping layouts for such situations. As an ISO 9001:2008 Certificated Company, Prime Steel Pipe is a leading manufacturer and exporter for short radius elbows and long radius elbows with the materials of carbon steel, stainless stee and alloy steel. The material is selected according to the application use such as high temperature use, sanitary fitting use, regular industrial use etc. The long radius elbows have a center to end distance 1.5 times the NPS in inches ( R=1.5D), while the short radius is equal to the NPS in inches (R=1.0D). Short radius elbows are generally used in tight areas, and long elbows are used when sapce is available and flow is more critical. We can manufacturer elbows up to 72'' with wall thickness ranging from 2mm up to 80mm for varied sizes. For seamless elbow, the outside diameter ranges from 1/2'' to 24''. For erw/welded/fabricated elbow, the outside diameter ranges from 24'' to 72''. The elbow ends may be machined for buttwelding, threaded (usually female), or socketed. When the two ends differ in size, the fitting is called a reducing elbow or reducer elbow. Along with build quality, the longevity and reliability of steel pipe elbows is highly dependent on the type and quality of the coating used. However, applying coatings to pipe elbows is not just about preventing corrosion, but can affect the evenness of flow through the pipe and the need to prevent contamination of pipe contents ((e.g. foodstuffs or drinking water). PRIME STEEL PIPE offer corrosion resistance coating service for steel pipe elbow, our coating service includes light oiling, black painting, FBE coating, 2 layers or 3 layers PE coating, hot dip galvanizing. We focus on every procedure to assure quality, the package we usually take is pack the steel pipe elbows with environmental poly bags, and then in free fumigation wooden cases or wooden palte. We also accept customized package such as OEM by negotiation. 1. Material shall be packed ready for export in a manner which allows easy handling and prevents damage. Vendor shall submit their standard packing procedure to purchaser for approval. 2. Open ends of fittings and flanges shall be supplied with heavy duty plastic protective plugs or caps. For bevelled ends, the caps shall protect the full area of the bevel. 3. Water proof barrier material shall be used for stainless steel materials to protect against chlorine attack by exposure to salt water atmosphere. 4. Carbon steel and stainless steel items are not allowed to be stored together and shall be packed separately. Generally, the elbow size designations are either long radius or short radius. 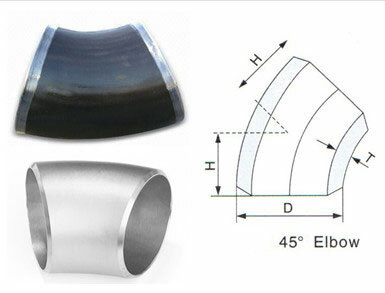 The long radius elbow is usually adequate for standard service conditions. For a particular job, the type of elbow selected is usually a compromise based on three considerations. Namely, the material flow rate, space available and initial cost. For service where the flow rate is critical and space is available, the user may select the long radius fittings. This gives him the least reduction in flow and pressure drop from internal friction resestance and stream turbulence. When space is limted and the flow rate is non critical, a short elbow is often selected. When fluids are moved long distances or must encounter many directional changes, short radius elbows are not recommended because of their greater friction loss, which may require installation of larger pumping equipment. A long radius elbow costs less than a short radius fittings. Long radius elbows offer minimum resistance to flow consistent with space savings and persently account for more than 90 percent of all elbows in use. The recommended procedure for a 180 degree change in direction is to use a formed 180 degree return fitting rathter than combine two 90 degree elbows or field fabricate a 180 degree pipe bend from a straight pipe piece. Returns are used primarily in heater coils and heat exchangers. The number of coils the space has available determines whether a short or long radius returns is desirable. All long and short 180 degree radius returns have center to center dimensions that are double those of matching 90 degree elbows.